My experience with Russo's catering was excellent! The tasting was helpful, as was Mark Russo & Katie W. They had great suggestions for us and an extensive menu of items to pick from. I appreciated not having to coordinate separate linens and tableware. We liked the option of doing a host bar offsite, which very few caterers offer. I look forward to using Russo's again for our next special event! The food and cake were delicious, and we got a flood of compliments throughout the night on both that and the friendly service Russo’s provided. Can not say enough positive things about the entire experience, as planning with Courtney was a true joy – she made everything so very easy! Thank you again, Russo’s! Words cannot express our gratitude to Russo’s catering for their amazing work – in fact without them our wedding reception would not turn out so beautiful!! We are extremely happy that we went with Russo’s for setting up the reception room and preparing the food and desserts. The people of Russo’s are absolutely wonderful, from the beginning, to even after your wedding day! Not only are they professional and experienced, but they are more than willing to work with you on your budget. We worked with Courtney as our coordinator for the administrative side including pricing, chair covers, colors, type of food and she was phenomenal!! She was professional, accessible and always going above and beyond to make sure everything was on track. For the actual reception our event captain was Justin, who was absolutely wonderful. It shows that Russo’s is one big team and every person involved with your reception will answer all of your questions. As a company Russo’s organizes a tasting reception that we strongly recommend going to. It is fun and the food is great. To our most pleasant surprise, the actual food at the reception was even better! We opted for a dessert selection self-service bar instead of the cake and we are still hearing compliments about the miniature sweets. They even decorated the buffet and dessert table elegantly while matching our colors! The execution of every detail we planned was flawless and the wedding reception went better than we can ever have expected!! Everyone was raving all night about how good the food was and some of the best they have had at any wedding or party. Another point person that evening was the reception coordinator Margaret who was very friendly and helpful! She carried our food to our table and was so thoughtful that she even put a sample of each dessert on our head table since we would never have a chance to try them. During the reception, their service staff was very professional and inconspicuous. What we love about Russo’s is that they will do all of your rentals and food, and they have great connections with other vendors. I highly recommend them for your wedding day or any other event, because they will make your day perfect! Thank you everyone in Russo’s!! We hired Russo’s to cater our daughters wedding. There are plenty of other companies to choose from but SO happy we chose Russo’s. The food and service were OUTSTANDING! The wedding was a few months ago and we still have family and friends telling us how wonderful the food was! Trust me…we are foodies and very happy we made the decision to go with Russo’s. They will not disappoint. Our wedding reception was catered by Russo’s and it was wonderful! Courtney was very easy to work with leading up to the big day, and even took pictures of the finished venue before the guests arrived for us to look at later! The staff was very friendly and Courtney was even there for the event and checked in with us to make sure we were doing well. The food was excellent. My husband said it was the best meal he had all weekend and multiple guests commented on how great it tasted ! The cake was also exactly what I had imagined. Very beautiful and tasty ! Thank you for making our day easy and lovely! 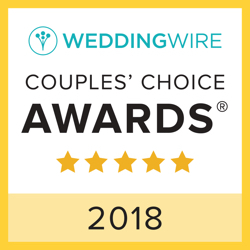 We chose Russo’s Catering from the preferred vendors list at our wedding venue. We were interested in doing a stations buffets, as opposed to a traditional buffet, and Russo’s had excellent options. Courtney was the contact we worked with. We were able to meet her face-to-face at one of Russo’s tastings, and she was excited to meet with us in person shortly after. She was friendly, flexible, and very easy to work with. She was always excited to see us and responded quickly to any questions we had. The reasonable price was a factor in our decision. Courtney even arranged to turn one of our stations into passed appetizers so that we could stick to our budget. My brother, one of our groomsmen, said the next day, “The mini beef wellington appetizer was the best part of the whole day. I almost cried.” Our guests raved about the food. The Italian Station (especially the tortellini) and Diner Station provided a variety that matched mine and my husband’s personalities and gave our guests options to choose from. We were able to choose four different flavors for the four tiers of our cake, and not only did it look exactly as we pictured it, it was delicious! My husband loves strawberry shortcake, so Courtney suggested mini-strawberry shortcakes as an additional dessert. They were in little cups with tiny forks and were absolutely adorable and scrumptious! We went in for the budget and came out with the most delicious food we’ve ever had at a wedding, and we have very high standards. Your staff were nothing short of fabulous at our wedding. I was very impressed with their level of professionalism and customer service. Also, the food was amazing!!!! Thank you so very much for taking care of my big day. I will recommend Russo’s to all of my newly engaged friends. It was perfect!!! So thanks again ? I just wanted you to know that we could not have been any happier with Russo’s catering! You were a pleasure to work with and Brian and especially Margaret went above and beyond to make sure that everything was perfect for us! Everything met and exceeded our expectations and I would recommend you to anyone planning a wedding. Thanks so much for helping us make Libby’s wedding a joyous event! I had to make all arrangements long distance and it could not have been easier! From the start I found the web site accessible and very user friendly. Courtney Mason was always helpful and communicated with the venue when I couldn’t. I enjoyed this event myself because there was nothing to worry about. The event staff was wonderful and attentive at all times. All the guests raved about the food and we also enjoyed the leftovers with friends the next day. I think that Russo’s and the Community Center of Clayton are the best match for any event. We were thrilled with the Gourmet Express experience. The dishes were imaginative and beyond delicious. Ease of ordering is a huge plus: peruse the online menu, call Scott, who will give you suggestions and reassurance, then pick up at their back door! Having Russo’s cater my party freed me to enjoy. Instead of being exhausted from planning, shopping, preparing and fussing during the party, I was able to enjoy. I’ll be ordering again. I can’t wait for my kids to get married, it’s going to be Russo’s all the way. The truck was here at work today and the guy gave me a free order of toasted ravs for doing him a favor earlier. A very nice act and the ravs were some of best I have ever had. Had the oven roasted Italian beef sandwich as well which was also delicious.. I just had my wedding reception here on Saturday, July 12. Everything was absolutely amazing! The staff here is so professional and helpful. From the very beginning with Emily, I felt comfortable with everything! I never had any worries and the entire experience was phenomenal! The hotel staff was even awesome! If you want excellent customer service, pick Spazio for any event! They will not disappoint you! Thank you so much to all the staff that worked my wedding!!!! You all deserve a raise!!! ? Russo’s catered our daughters wedding reception. Our guests raved about the meal saying it was delicious! We agree! High compliments from all of our family and friends. The buffet presentation was perfect and the staff pleasant and professional. Thank you! My husband and I had our wedding reception at Spazio Westport on October 18, 2014. Our experience was phenomenal. Mark Russo and Emily Otto were extremely helpful throughout the entire process. Erick the chef at Spazio worked hard on preparing the food for our family style reception exactly the way we requested it. We are still receiving compliments on how lovely the garden room and bistro were set up as well as how delicious the food was. Larren and Nikki did a great job on the presentation of the set up as well as the food. Our cake was done by Russo’s and it looked and tasted exceptional. We will recommend Spazio Westport and Russo’s Catering to anyone we know. Thank you, to everyone for your hard work. We had Russo’s Food Truck at our office today for a private event. The food and the service was amazing. We hire food trucks throughout the year for our employees and we would use them again! Can’t thank them enough for making it today, since it was 20 degrees outside. They were wonderful! You are THE BEST caterer in the entire world! Everyone from Russo’s is professional and easy to work with! Thank you for helping make my July 2014 wedding, a day I will NEVER forget!! Keep up the amazing work!! My wedding reception was fabulous. I couldn’t be more happy with Russo’s.